Waen y LLyn and their working parties. I cannot mention everybody but so many people gave up their whole day for these competitions (and days before too) and without them the competitions could not go ahead. Both Area qualifiers ran without a hitch at two super venues, Somerford and Bolesworth. 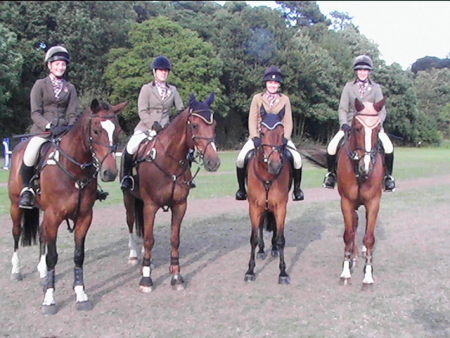 Both were showcases for how events should be organised as was the Area Dressage at Somerford earlier. Flint and Denbigh Branch have qualified for the Pony Club Championships in both the Open Team Eventing, Ant Woodbine, Brier Leahy, Lois Roberts and Sophie Toogood and Open Team Show Jumping, Lois Roberts, Heidi O’Brien, Brier Leahy and Sophie Toogood, Heidi, Brier and Sophie also qualified individually. Brier has also qualified for the Individual Intermediate Dressage. Lucy Roberts has qualified for the Novice Show Jumping on Alfie, well done Lucy and Sophie Wilson has qualified in the Intermediate Eventing on Lookout Lollipop! Best of Luck Flint and Denbigh! Please find attached the results from Area Dressage 2015.